Want to quickly see how the open-source software Gallery works? You'll find a free and updated demo installation of Gallery here. We are currently updating the Gallery demo. Please check back shortly. There will be a new version up soon. 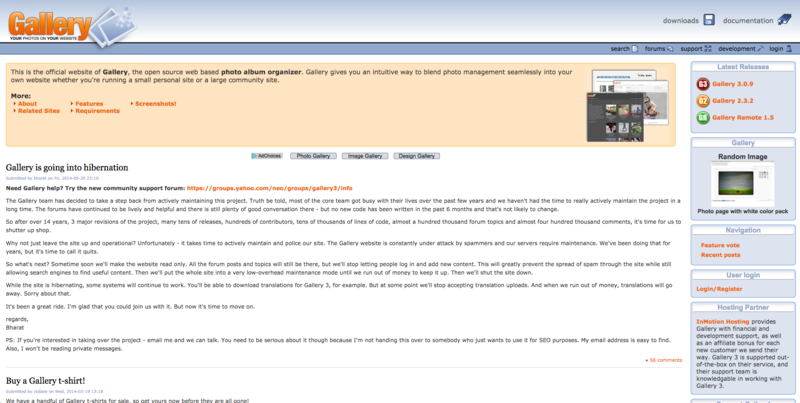 Gallery is a free open source web based photo album organizer developed using PHP as a programming language. Looking at a Gallery demo you’ll see that some of its features include image resizing, rotation and flipping and other photo manipulation options. If you want to set up your own Gallery demo site you can download it using the link below and go through the installation process. However, you need to have your own website with PHP and a database. The latest version available for download is 3.0.9 and was released on June 28, 2013. The project is no longer being developed or maintained by its team of developers.